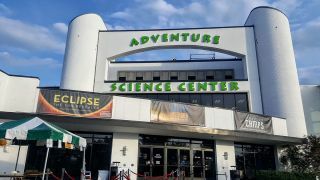 The Adventure Science Center in Nashville, Tennessee is hosting an event for the total solar eclipse on Aug. 21, 2017. Hey there, space fans! In case you missed it, the Great American Solar Eclipse just swept across the United States today (Aug. 21). But just in case you did miss it, Space.com has you covered. I'm blogging about the eclipse from the Music City Total Solar Eclipse Festival in Nashville, Tennessee — the largest city in the path of totality. Check in below for live updates from the Music City! Nashville's iconic "Batman building" (the AT&T building downtown) towers behind the welcome banner at the Adventure Science Center. The eclipse just ended in Nashville, Tennessee, and if you thought the moon was good at casting shade on Earth, you didn't probably didn't see the monstrosity of a cumulus cloud that casually rolled in over this city less than a minute before the start of totality. Weather prospects were looking good up until the moment when people in the crowd starting shouting, "It's almost time for the diamond ring effect! Look up!" The partial eclipse was easily visible over Nashville before clouds rolled in to obstruct the total solar eclipse. While I am super bummed by this giant ninja cloud that came out of nowhere to obstruct my view of totality, I must admit that those (almost) two minutes of totality were still totally amazing. I've been sweating profusely in 90-degree weather all day, and suddenly it was cool enough outside to give me goosebumps. Crowds outside the Adventure Science Center watch the partial solar eclipse before a cloud blocked out totality. I had almost forgotten about how obnoxious cicadas could be in Tennessee, my home state, until the insects started screeching at full force just before the sky fell dark. Never in my life have I been able to appreciate that stupid screeching sound until today. It was as if the bugs were letting us know that totality was about to happen. In reality, the eclipse just tricked them into thinking it was nighttime. The birds that soon began flocking to their nests were probably thinking the same thing. The sky over Nashville turned purple during the solar eclipse. With the cloud in the way, it was hard to tell exactly at what instant totality began. We didn't get to see Bailey's Beads or the sun's corona. Skies darkened to a deep purple over the course of maybe 15 seconds. Even though I thought I knew what to expect during totality, a strange sense of confusion took over my entire body. The cold, the darkness, planets becoming visible during the day, the untimely animal behaviors ... everything about it was just surreal. Overall it was a pretty cool experience. Now it's time to start counting down to the solar eclipse of April 8, 2024! Little partial eclipses were visible in the shadows of trees outside the Adventure Science Center in Nashville. The Music City is getting super stoked for this total solar eclipse! We're already seeing the partial eclipse starting over Madras, Oregon, and it's looking pretty fabulous. I can't wait to see it with my own eyes! Here at the Adventure Science Center, crowds have gathered in, around, and even on top of the building to get a good viewing spot. So far, the weather looks like it's going to cooperate — although it is extremely hot and humid outside. I spoke with astrophysicist and Space.com columnist Paul Sutter, and he said he's looking forward to the temperature drop that will come with totality. That sounds like it's going to be delightful. Before the solar eclipse, the sun showed off some sweet sunspots this morning (Aug. 21). On the roof of the Adventure Science Center, I ran into Gary Parkerson, aka. "the Pedaling Astronomer," who has spent the past 15 months biking across the U.S. with his telescope and camping gear. Gary let me peek at the sun this morning through his bicycle-mounted telescope (with a solar filter, of course), and I saw some cool sunspots! I'll check back with him during the partial eclipse and try to grab some photos of the moon taking a big bite out of the sun. Stay tuned for more updates, and happy eclipse watching! Gary Parkerson, "the Pedaling Astronomer" (left), let reporters use his telescope to check out the sunspots on the morning before the eclipse. Gizmodo's Ryan Mandelbaum (that dude with the cool sunglasses) got a look, too! Today I drove from my hometown of Knoxville, Tennessee, to Nashville, completing the final leg of my journey from Brooklyn, New York, to see my first solar eclipse. To my surprise, traffic wasn't any worse than usual on I-40. Nashville is expected to experience some of the worst traffic in the country because of this solar eclipse, but none of that anticipated traffic was apparent today. And while weather forecasts last week predicted a 40 percent chance of rain in Nashville during the eclipse, now it looks like we'll have clear skies! I spotted some sunspots on the sun while testing out my eclipse glasses on Sunday morning. This morning before I left Knoxville, I took my solar eclipse glasses out for a test run in my parents' backyard in Knoxville. I didn't expect the paper glasses to fit nicely over my regular glasses, but they fit just fine. Hooray! I spotted some faint sunspots, which was pretty cool. After I made it to Nashville, I scoped out the Adventure Science Center and made a pit stop at Krispy Kreme to try out their limited-edition eclipse-themed doughnuts. To celebrate the total solar eclipse, Krispy Kreme has a new chocolate-glazed doughnut that you won't be able to buy after Monday, Aug. 21. Now I must admit that I've never been to Krispy Kreme, but these eclipse doughnuts drew me in. I fell for the hype. Unfortunately, it didn't really look like a solar eclipse, and it could hardly even pass for a doughnut. Thankfully, the actual solar eclipse should be far more impressive!